*Christmas is over, and I can finally breathe….I took a relaxing shower and slipped into my new black Vera Wang pjs I bought myself last week. I saved them for Christmas. To me, there’s something really necessary about having new pajamas to wear on Christmas. Silly, yes, but oh, so essential. *A few days ago I blew the dust off my sewing machine and managed to find my favorite Folk and Whimsy doll pattern, Matilda Peabody. She was calling to me. So I dug out my muslin, pressed it and began the creation process. I’ve finished her body….now comes the fun part. I really love this doll because she’s a big girl, with very shapely arms and legs and she’s a fun twist of Victorian meets prim. I am hoping she will imbue me with the urge to begin redesigning dolls again. Doll making is what I do well, and I’ve got a lot of practice making dolls. But still, I want to get better. I’m looking forward to having Matilda around to inspire me. *I absolutely love Burl Ives Christmas songs. To me, his voice is like pinecones and evergreens. When I hear Holly Jolly Christmas and Silver and Gold, the songs send me back to how it felt to be a child at Christmas. With that, a sting of sadness quickly follows behind. Its a sadness because I miss my dad. *I realized a few months ago that I no longer remember what my father’s voice sounded like. As hard as I try, I can’t remember it. That makes me very sad. He’s been gone since 1982. Time has a way of playing nasty tricks on one’s memory. *Strawberry Jello pies are desserts from heaven-especially if they gel firmly. My mom can make them perfectly. I can’t. No matter what I do, they never solidify….always mushy for me. *Today I ate a strawberry pop tart (but the organic, Trader Joe brand)-HEAVEN. It’s been YEARS since I had one and instantly it tasted like being a kid….now I remember why I loved them so. I want another one now. *Yesterday, on Christmas eve I popped in my favorite Goodwill Store just to see if there were any goodies left. I was in the mood for a quickie treasure hunt. 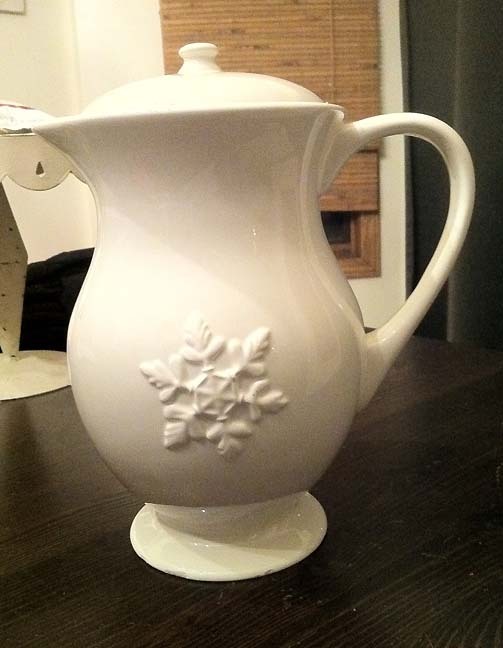 I love white ironstone pitchers and I spotted a tall one with a lid sitting on a metal shelf. I picked it up, took a quick glance at the bottom and was delightfully surprised to read the words POTTERY BARN SNOWFLAKE. Score! I paid $4.99 for it. I was so happy, I skipped to my car feeling like I just got an early Christmas present. My serendipitous Christmas Eve find at Goodwill. 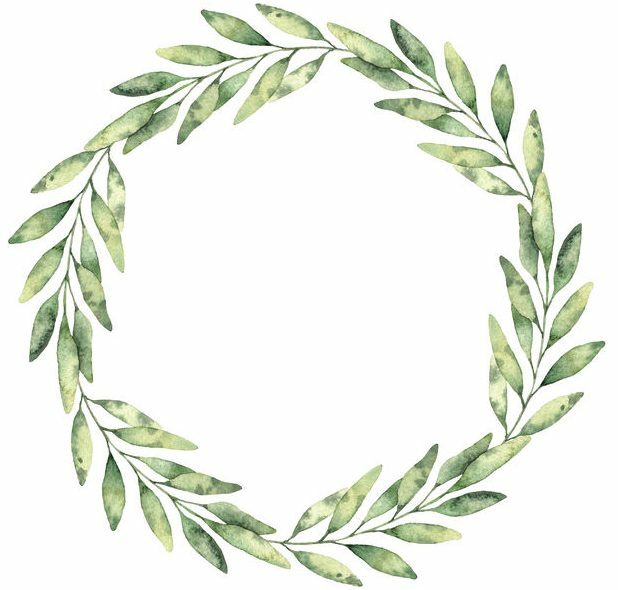 *Rose Salve is the best stuff. I tried it after I read that Sarah Jessica Parker considers it one of her top 5 or 6 favorite beauty products. Like Sarah, I apply it to my lips every night before I go to sleep and it keeps them soft and the dryness away. I love the smell. Not only is the salve great for lips, after the stitches in my toes were taken out after my foot surgery I applied the salve to my scars to heal them. It worked like a dream! I highly recommend you try it. I purchase mine at Bath and Body Works. An amazing product. I got it for all the ladies on my gift list this year. *This new year my hope is to teach myself Adobe Illustrator and learn French from Rosetta Stone software. I’m thinking, if I end up going to Paris anytime soon (yeah, right) I’ll need to speak the language, so I better get on it. *Tonight I’m really in the mood to dive back into Great Expectations. I’m past the half way point and I’ve been taking way too long to finish it. I hope to make a serious dent. Good night all. Dickens is calling me. Hey Em, I hear ya on the bedroom mess, only mine is my walk in closet. I planned to do it this winter. I’ve gotten back into sewing dolls too. Gave some as Christmas gifts. I think you write so well. Take care. Merry Christmas to you! 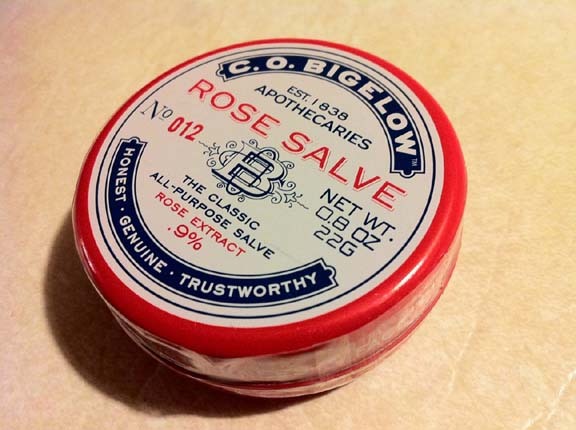 Oh….Rose Salve. Everytime I think of that I can actually still remember the smell. My Busia (Grandma) always had that above the water basin in the kitchen. It was to her what Windex was to the father on “My Big Fat Greek Wedding”. If it couldn’t be cured with Rose Salve or Cod Liver Oil she would say the rosary for you, because impending doom was headed your way. Ha. Thanks for the memory!